Start your day off feeling full and healthy by indulging in this warm and spicy breakfast quesadilla! In a skillet, prepare egg substitutes with green peppers, onions, and 1/2 cup cheese. Flip once. Cook until done. Heat tortillas in the microwave about 30 seconds, until warm. 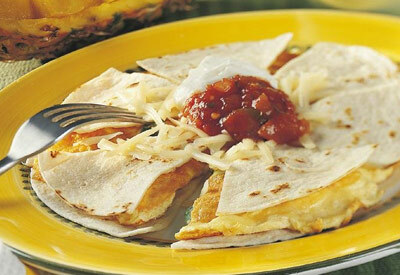 Layer a tortilla, egg mixture and tortilla with cheese on top.